Using sophism the ”All Positive/Force-Free’ companion dog trainers have convinced themselves and others that any collar around a dog’s neck is now inhumane and that harnesses are currently the only humane choice. Perhaps, to the average companion dog owner, dog trainer, veterinarian, vet tech etc. this isn’t as apparently revealing as I wish it were. So let’s take a closer look. Aren’t dog trainers supposed to be helping people to teach their dogs to exert self-control as opposed to relying so heavily on physically controlling them that they fear repetitive motion/strain injury? Shouldn’t any piece of dog training equipment be no more than a means to teach a dog to exert self-control? Post training, continued use of a training device should be in the context of an emergency brake not as constant never-ending, beginning to end of a walk, walk after walk, year after year application of the brakes. For many reasons, I’m not a fan of harnesses as a training tool (as opposed to safety harnesses.) I’ve found that in the vast majority of cases where the claim is that it stopped pulling the reality is that it reduced pulling to a manageable degree from the companion dog owner’s perspective. It partially solved the companion dog owner’s problem but didn’t address the dog’s issue. That’s not what dog training is. But I don’t care what you want to use if you think harnesses provide sufficient leverage and safety to both dog and handler – go for it. You’re not right, both you and your dog will have to work harder, and there is a far less chance you’ll get real-world results, and I think there are opportunities for a dog to escape harnesses that are greater than some other training tool. But bottom line, just as long as a result is a happy, trained dog, I’m glad for you. That means a dog that doesn’t pull whether their are distractions or not. What has my knickers in a knot is that the ’’All Positive/Force-Free” dog trainer movement is once again proving to the world that they aren’t the most critical thinkers amongst us. Although I see far more disadvantages to both companion dogs and their owners, training harnesses are just another potential tool in the dog training tool bag. ”All Positive/Force-Free” dog trainers are saying harnesses should be used INSTEAD of all other training apparatuses because harnesses are more humane and go so far as to state anything around the neck is inhumane. The reality is that their approach to dog training provides results so unfortunate that rather than merely teach a dog not to pull they are in droves now encouraging companion dog owners to drive with their parking brakes on all the time. For those that haven’t been on the companion dog training scene as long as I have, we went through this once before. ”All Positive/Force-Free” dog trainers introduced and used to be big on head halters until someone explained to them the inherent risks. Somehow the horrible reactions they got from the dogs forced to wear them wasn’t enough. Gentle, yeah right. As they did with the head halters and now with harnesses, somehow they ignore basic physics as it applies to the use of force/mass/ acceleration/area and body mechanics. This “harnesses good” all other dog training tools terrible proclamation shouldn’t come as a surprise to anyone familiar with their poor grasp and interpretations of basic behavioural learning scientific principles. They’ve taken real science and distilled it into nothing more than a self-serving income stream generating classic pseudo-science. These charlatans pretend there isn’t a massive body of scientific evidence from a wide range of disciplines (ethology, evolution, evolutionary psychology, sociobiology, anthropology etc.) that doesn’t just suggest they are entirely wrong. It categorically, positively, solely indicates that not only are they wrong but the near opposite is true. In the real world setting of companion dog ownership, as in any real-world environment where the goal is teaching life skills, as opposed to tricks, the concept of ”All Positive/Force-Free” all the time, ignore bad behaviour, reward good behaviour, fling a treat at it, is insane. In this context, there is not one iota of evidence to suggest that their delusional views are real science. It’s only remotely possible that such huckster “scientists” could be unaware of the tsunami of evidence that says outside of highly controlled environments, i.e. the aquarium containing the performing orca, they are entirely out to lunch. Even so, how can they ignore their life examples? Have they ever learned any meaningful life skill that was taught to them in an ‘All Positive/Force-Free’ manner? Have they ever tried to change the diaper of a cranky infant? How about putting a tired toddler into a car seat or a snowsuit? Using their philosophy, the kid will have outgrown the car seat, and the snowsuit before the training would be complete. I don’t even want to think of the diaper changing ramifications. 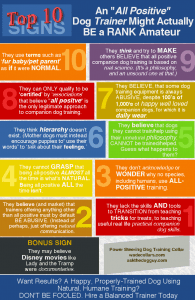 Before these delirious “thinkers” have a chance to pull another of their dirty marketing tricks by trying to make you think that the only option to ”All Positive/Force-Free” companion dog training is ‘might is right’, yank and crank, choke a dog out dog training, let me pre-empt. ‘Might is right’ training is wrong, and in spite of their neurotic insistence, it is to the contrary, not the only alternative to the false god of ”All Positive/Force-Free”. Functional training involves building a teacher/student relationship (not dependent on treats). Corrections and reward are almost always expressed with nothing more than tone and body language. Physicality between a dog and owner via a leash and collar (or harness), when required at all, is limited to handling, handler and dog safety concerns. It is also a means to get a distracted dog’s attention. For example in much the same manner a child tugs on a parent’s tie or skirt to get parent’s attention. Proper training is never ”All Positive/Force-Free”, but it is always mostly ‘All Positive/Force-Free’. It is not ‘might is right’ based. Proper training is appropriately balanced to the needs of the dog not some crazy extremist dog training philosophy. Neither science or common sense supports their idiocy, and yet they keep peddling this nonsense to unsuspecting veterinarians, vet techs, new dog trainers and companion dog owners. All the while portraying themselves as angelic “scientific” dog lovers and demonising the actual science. Along with any person that so much as suggests that the concept of being the unhappy recipient of I’m not asking you, I’m telling you, is nothing more than a regular part of the life skill accumulation experience. Once I might add, provided by fiercely loving parents of every social species the world over, throughout the entire history of higher order social species. Name one parenting higher order social species (dogs, wolves, apes, human being etc. ) that utilises either ‘might is right’ or ”All Positive/Force-Free” teaching. You won’t find any because, in the real world, it doesn’t exist – because it doesn’t work. It doesn’t work because it doesn’t increase the chances of learning skills that lead to productive lives. It as any companion dog owner forced to fling treats or click and fling has found, it reduces them. If you’re aiming at your dog’s tummy and not a teacher/student relationship through its brain, you’re missing the best part of the dog. ‘’All Positive/Force-Free” is fine (and I use it) for tricks, scent detection, to a certain extent and only up to a point with traumatised dogs and puppies but it’s horrible for teaching real-life skills around real-life distractions. Even in controlled aquarium environments where some unfortunate mammals find themselves, it has repeatedly been proven to produce some very unhappy disturbed life forms. Orcas have never attempted to kill or killed a human outside of these ”All Positive/Force-Free” training environments in spite of having ready access to swimmers, divers, kayakers all along the North American west coast. If you want to see the practical, real-world failure ”All Positive/Force-Free” trained Orcas watch this video and instead of Orca and Pelican think Dog and Squirrel. Count the number of fish flinging trainers trying to regain control. Do they think that pressure just transferred from one body part to another, isn’t going to result in other equally physical severe issues if they don’t train the dog as well? What do they think that force now focusing on another body area is going to do over the not so short and long-term? Dog owners with pulling dogs often end up with injured, sore elbows and shoulders. Do these “science” based ”All Positive/Force-Free” trainers think the force used on those limbs isn’t being exerted on the body at the other end of the leash? Unfortunately, dogs can’t tell their owners of these early soreness signals. It will have to continue until the even more severe damage is done. The dog training, veterinarian, vet tech communities need to wake up. Some of these nutbars are trying to pass their sophism philosophy off as the only humane way to train a dog and have it legislated into law. Stop falling for and supporting this nonsense. Take a closer look at the ”All Positive/Force-Free” “science”, and you’ll find you don’t need a scientific doctorate to see it’s pseudo-science. Speak up! Just as ‘might is right’ training is bad for companion dog owners and their dogs, ’’All Positive/Force-Free” companion dog training is bad, bad, bad for dogs and their owners. Start challenging these crazies before it’s too late. Speak up! It’s not the tool; it’s the fool at the end of the tool that endangers a dog. 1.) If you’re a companion dog owner with a pulling dog and you’ve tried everything, check out my most recent e-book. 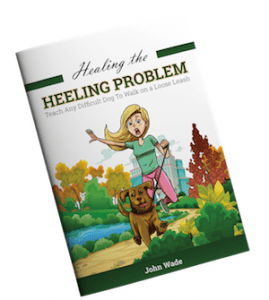 Without treats and ‘might is right’ it will help big time.John Wade’s Healing the Heel – Teach Even a Difficult Dog to Walk on a Loose Leash.